UNITED NATIONS, Sep 13 2013 (IPS) - The upcoming event at the United Nations is being billed as something politically unique. But expectations for the meeting are low, says Jayantha Dhanapala, a former U.N. under-secretary-general for disarmament affairs. Unless disarmament becomes a priority for possessor states, he told IPS, speeches and meetings alone are not going to change the stark dangers posed by this most destructive weapon of mass destruction (WMD). “A decision to outlaw nuclear weapons in the same way as biological and chemical weapons is essential,” said Dhanapala, who is president of the Pugwash Conferences on Science and World Affairs, which jointly won the 1995 Nobel Peace prize for their efforts at nuclear disarmament. “The time to start negotiations on a Nuclear Weapon Convention (NWC) is not tomorrow but now,” he said. Secretary-General Ban Ki-moon, who has consistently maintained that nuclear disarmament is one of his top priorities, is expected to call for “a world free of nuclear weapons” at the meeting scheduled to take place at the United Nations on Sep. 26. He said non-nuclear governments should participate at the highest level, and make strong statements that they are more secure without nuclear weapons and that the security of all in the 21st Century requires the abolition of nuclear weapons, meaning that it is a “global good of the highest order”. Ware said they should also pledge to dedicate greater resources and political traction to developing the building blocks for a nuclear weapons-free world through the Open Ended Working Group (OEWG) to which the nuclear weapons states (NWS) have an obligation to join. Currently, there are five declared nuclear weapon states, namely the United States, Britain, Russia, France, China, all five permanent members of the Security Council (P5), along with three undeclared nuclear weapon states, India, Pakistan, Israel. Despite its three nuclear tests, North Korea still remains in limbo. The three undeclared nuclear powers have all refused to sign the Nuclear Non-Proliferation Treaty (NPT), as against the five declared nuclear powers who are states parties to the treaty. Dhanapala said nine countries – five within the NPT and four outside – possess a total inventory of 17,270 nuclear warheads today, 4,400 of them placed on missiles or located on bases ready to be launched in minutes. The U.S. and Russia alone own 16,200 of these warheads, he pointed out. And despite the lingering horrors of Hiroshima and Nagasaki, the risks of nuclear weapons being used again – by design or accident, by states or non-state actors – are huge, he added. “The results would be catastrophic for all humankind,” Dhanapala warned. Ware told IPS the role of nuclear weapons could be reduced in Northeast Asia through negotiations for a North East Asian Nuclear Weapon Free Zone. The U.S., he said, could exercise more effective diplomacy in the Middle East to move the Arab states and Israel to participate in good faith in the proposed U.N. Conference on a Middle East Zone Free from Nuclear Weapons and Other Weapons of Mass Destruction. Arab States are demanding preconditions that are unacceptable to Israel, so both need to exercise some flexibility, he noted. Non-nuclear countries could use the OEWG, as long as the mandate is renewed, to commence preparatory work on the building blocks for a nuclear weapons-free world (based on the Model Nuclear Weapons Convention circulated by the secretary-general) regardless of whether or not the nuclear weapons states join the OEWG in the near future. Dhanapala told IPS the first Special Session of the General Assembly Devoted to Disarmament (SSODI) was held in 1978 as a direct outcome of the summit of world leaders of the 1976 Non-Aligned Movement (NAM) held in Colombo, Sri Lanka. It was a period of detente in the Cold War and a far-reaching Final Declaration was adopted. No multilateral gathering has matched that remarkable consensus on fundamental concepts achieved 35 years ago, especially on the priority of nuclear disarmament, he added. “Yet today, the multilateral disarmament machinery established by SSOD I is in grave disarray,” he said. The sole multilateral negotiating body, the Conference on Disarmament, has neither negotiated treaties nor even adopted a programme of work since 1996, according to Dhanapala. The Disarmament Commission has met ritualistically every year without any agreed texts in the last 14 years. 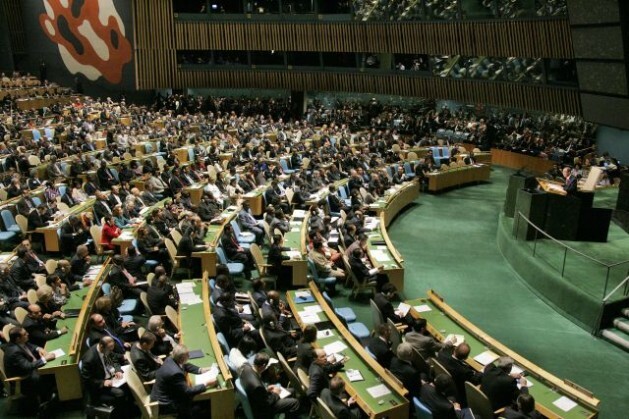 And the U.N.’s First Committee, dealing with disarmament, is still churning out resolutions with little impact, he added. “While the mirage of a nuclear weapon-free world is held aloft, the CTBT has not entered into force, the promised conference on the Middle East as a WMD-free zone has not been held and bilateral U.S.-Russian nuclear disarmament talks have not even started,” Dhanapala said. The need for a radical change has been recognised by the countries of the North Atlantic Treaty Organisation (NATO) and their supporters have resisted NAM demands for a SSOD IV. A one-day high-level meeting of the General Assembly is a compromise, he said. The 2010 NPT Review Conference with its 64-point action programme and the increasing recognition of humanitarian disarmament are an inadequate basis for the non-nuclear weapon states, most of which are in legally recognised nuclear weapon-free zones, to trust the nuclear armed states to disarm. The Sep. 26 meeting must be the beginning of a nuclear disarmament process, Dhanapala said.